This is a very new brand to me and was kindly sent to me by MANKIND to try out and see what I think. This isn’t a sponsored piece either, but I’m always excited to share new brands that I think are effective, accessible and gosh-darn pretty! This New-Zealand brand is beautifully executed. Their packaging and design gives me all kinds of life. It’s also not a brand you’d expect to come from a former pro-cricketer turned skincare officionado, Dion Nash. The brand is his brainchild, and created by a team of expert chemists and perfumer. The branding comes from the Rudyard Kipling poem ‘If’, given to to Dion by his father and serves as the ethos of the company. 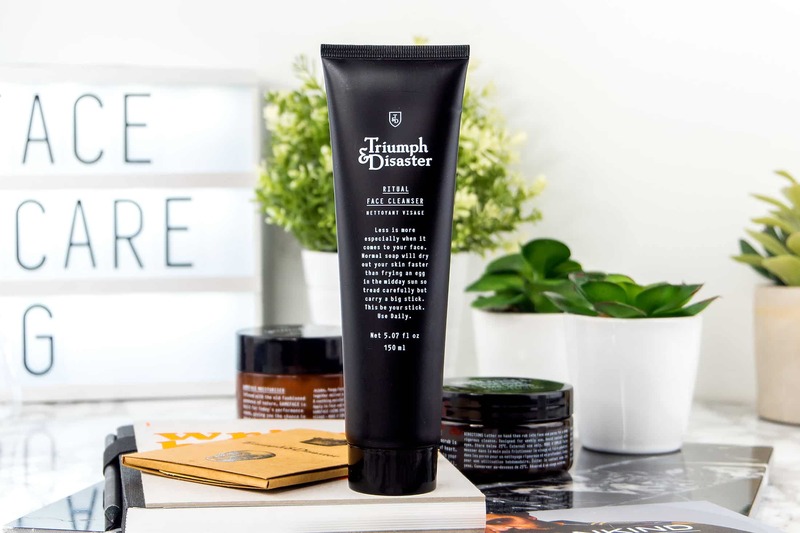 This alcohol-free product is loaded with local New Zealand ingredients including Ponga (silver fern) and Horopito (an ancient flowering plant). 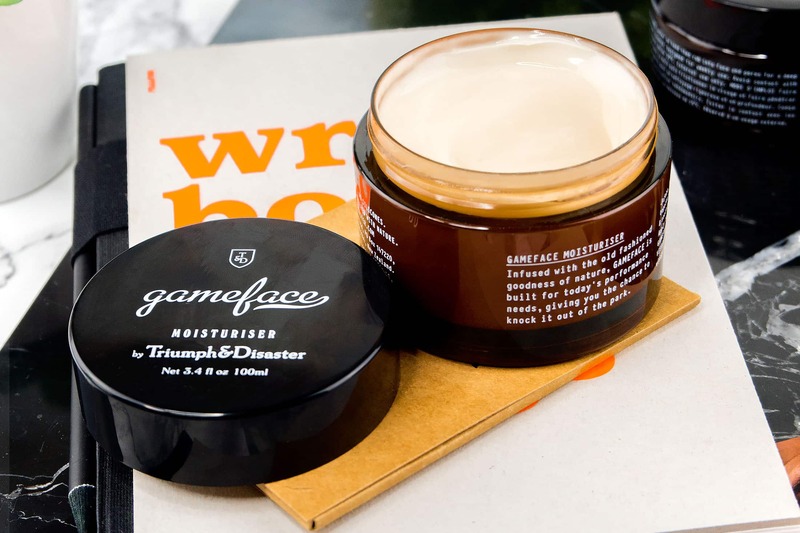 It has a water and glycerin base with olive oil and jojoba, two non-comedogenic oils that balance moisture without leaving you greasy, but this is definitely normal/combination product. 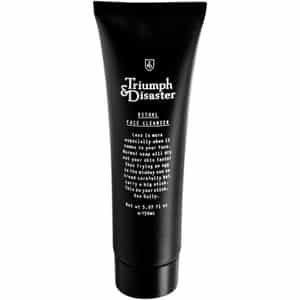 It has a very light gel-cream texture that sinks in fairly quickly and has a very cooling feeling. It does contain a little benzyl alcohol, used in this case as a preservative as it’s very low down on the ingredients list – remember that ingredients lists always go from highest concentration to lowest. There’s also Vitamin E as an antioxidant and Salicylic Acid to break down the bonds of dead skin cells during the day. 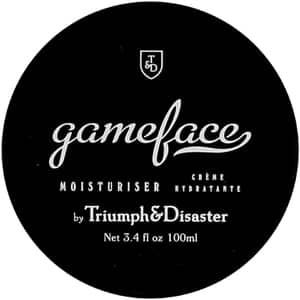 Triumph & Disaster Gameface Moisturiser Tub 100ml. £36. MANKIND. Finally the natural fragrance has been produced from oils of Galbanum, Patchouli, Anise, Lavender, Geranium, Clove, Ylang, Sandalwood, Cinnamon, Benzoin and Orange. It has a gorgeously earthy and musky shade to it. This is a fun one. With Koalin, Green Clay and Volcanic Ash, you apply it to your skin thinking it’s just a mud mask with no grains whatsoever. As soon as you begin to work it into your damp skin, you’ll almost immediately feel the tiniest and roughest grains getting to work. 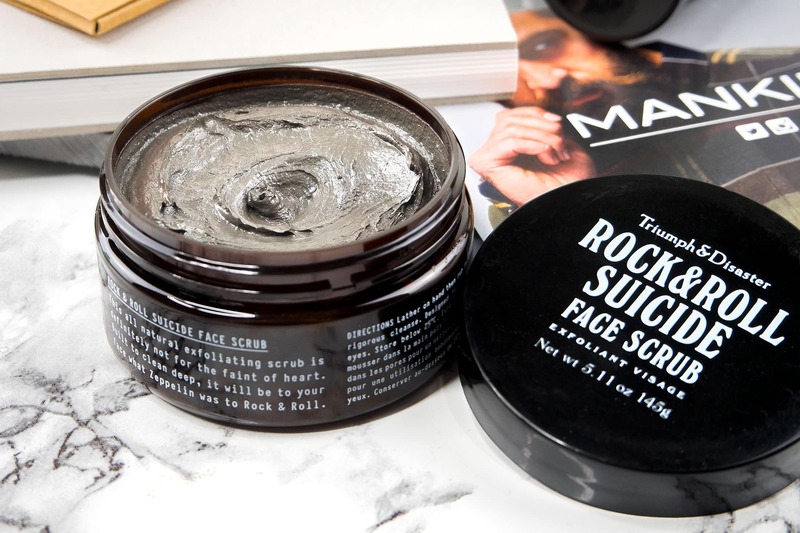 Many don’t like or even recommend physical scrubs like this, but I’ve used them for most of my life and if used sensibly, make great differences to your skin! I do have to moan about the packaging here. I use a face scrub in the shower and even on the odd times I don’t, it’s always around water which is almost impossible to avoid getting in the pot. It seems daft as there appears to be no reason this couldn’t have been tubed – it’s not that thick. Another gorgeous fragrance and very similar to that found in the TOM FORD grooming products, including natural oils Cedarwood, Patchouli, Pine, Eucalyptus, Pepper, Peru, Bergamont, Lavender, Sandalwood & Jasmine. It’s quite stunning! 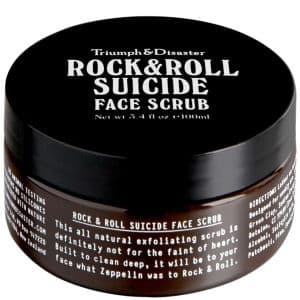 This is probably my favourite product out of the three. With milder, coconut-based cleansing surfactants rather than harsher soaps, it gives the softest and most subtle foam whilst really doing its job. Tamanu Oil, a natural anti-inflammatory ingredient as well as skin-conditioning peppermint oil get to work with a little kaolin and gently exfoliating salicylic acid. It’s really quite a wonder product and exceptionally well formulated. Again there is a little Benzyl, but not much and again used for preservative purposes. The packaging is annoying once again. With this the lid on the bottom screws off which means you’ll spend most of your time picking it up from the bottom of your shower – a flick lid would have made this product perfect. I know this might sound nit-picky but when you use a product every day, it can grate. Finally, if you do make a purchase, there’s 15% off when you spend more than £50 using code MK1550 and also 19% off for new customers with code NEWCUSTOMER. Thank you in advance if you use my affiliate links! This article first appeared on MANFACE written by Thom Watson. It was published on Wednesday 20th July 2016 and was last updated on Monday 3rd April 2017 at 12:49pm. 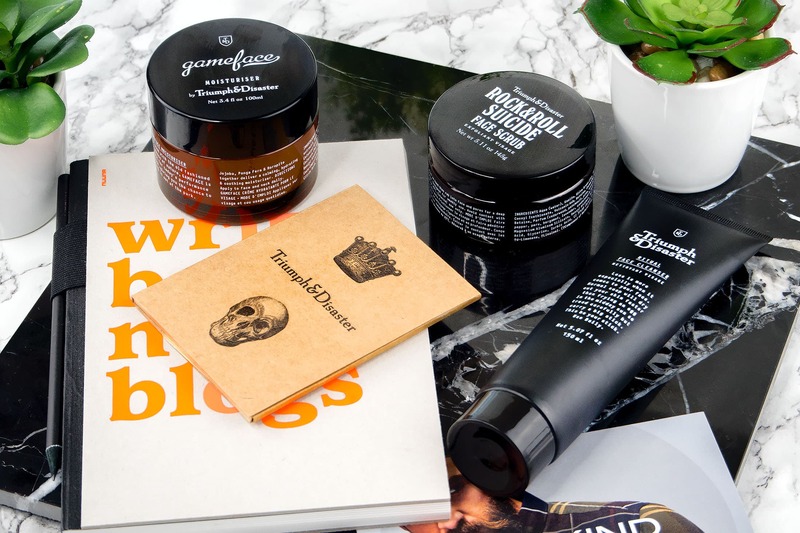 It's categorised under Acne, spots & blemishes, Cleanse, Combination Skin, Exfoliate, Moisturise, Oily Skin, Triumph & Disaster where you'll find more related content.